I am Sarah Polley. I have been a full- time resident since 1986. I have a wealth of knowledge of the area and I am an advocate and give a tremendous amount of support to our local mountain communities and businesses. I was born in Southern California and moved to Lake Arrowhead as a young child. Our family instantly fell in love with the area. The clean air, crisp mornings and the fun, long summer days at the dock became home. It truly became my lifestyle at a very young age. I attended Kindergarten through High School in Lake Arrowhead. I graduated in 1999 and then soon after, started raising my family here. I then graduated with a BS degree from Cal State San Bernardino with high honors. Now as a family, we too get to enjoy the Four Season lifestyle--nearby winter skiing, golfing, boating, swimming, fishing, water skiing, dinner in the village, watching the village concerts, viewing amazing sunsets, warm summer nights, thunderstorms, sky high 4th of July fireworks mirrored on the lake and just breathing the clean mountain air is home to us! We are also active members in the community, volunteer, donate to local charities and belong to the Lake Arrowhead Country Club. The Lake Arrowhead Country Club is a great family oriented place to golf, play tennis, swim, dine and be entertained! My priority is to pass on this same feeling to my clients. 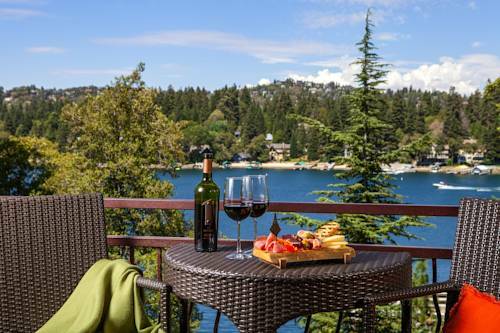 I want you to experience home and feel a sense of the Four Season--Lake Arrowhead Mountain Lifestyle! My wish is for you to enjoy our little slice of heaven and experience the friendly, safe, secluded and fun atmosphere- either for a vacation or full-time. Not only will you experience professionalism, you will also receive the highest quality of service on the mountain! We are top producers at Coldwell Banker Sky Ridge Realty and we take pride in helping our clients get what they want. I will give you 100% of my time and offer a wealth of knowledge and passion when it comes to your home, buying or selling. I am very savvy with the internet, social media and use many marketing tools throughout along with high quality and professional photos of your home. I can also give you the right tools needed to help make the right decisions for you. These precise tools through social media will enhance your home and provide a quicker sale for you! I am here for you as a buyer’s agent or listing agent. I will listen to all of your needs, dial into exactly what you are looking for and devote all of my energies into you. I am here to give you the highest quality of service and make sure your buying or selling experience is easy, smooth and successful as possible! You can count on me! Let's start turning your dreams into reality! Sarah was a delight to work with and, as a native, she was very knowledgeable. She helped us through some difficult and complicated developments in a creative and practical manner. We can recommend her enthusiastically. Once in a while you meet a professional who is knowledgeable, service-oriented and with a high degree of integrity. Sarah Polley embodies all these qualities. My wife and I have moved quite a few times over the past 34 years and the experience of selling our house with Sarah’s leadership was the most pleasant and enjoyable. She paid attention to our needs, was always easy to talk to, and sold our home quickly. She went beyond the call of duty and helped us with some loose ends even after the property was sold. I would strongly recommend Sarah Polley’s real estate services to anyone who wants to sell their home quickly and have a great experience throughout the entire process. – Jack and Lisa Jones, Redondo Beach, CA. Sarah was an excellent agent, who was there throughout the offer and purchase of my new home. I would recommend her to anyone I know, and would contact her again, for any real estate needs!